Before we get to why I don't personally love this, lets talk about the packaging and how it fits in with the Lock Confidant. Of course a pen named the Key had to be made of brass. It only makes sense. 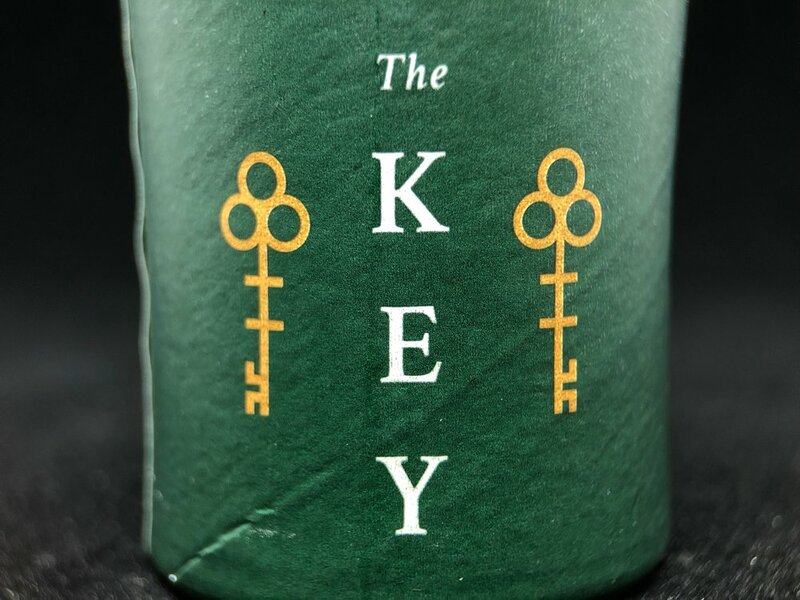 The tube, all dark forest green and gold to match the Lock, holds also the key to the cipher from the Confidant's packaging. I love where they placed it, revealing it when you take the top off the tube. Not all the letters are there; they give you 22, and it's up to you to figure out the other 4. I think I like the execution and the idea of this pen better than the pen itself. It's not that this pen isn't great. In the Venn diagrams where fans of the Squire and fans of brass pens intersect, this will be perfect for them. I just happen to be firmly outside of the "fans of brass pens" circle. When review unit requests were sent out, I was torn on whether to go for one, because I knew I didn't like brass pens in general but I was definitely curious to see what one of my favorite and most-used rollerball pens would be like with a brass body. The construction is exactly the same as a standard Squire. There is no change in the parts, from what I can tell. The balance is still there. It's beautifully machined and widens near the bottom. The twist mechanism is the same. My problem is that it weighs in a over twice the weight of an aluminum Squire. Fans of brass pens will tell you that's most of the reason they love them. I find the heft to be just too much to handle without tiring after only a few pages of note taking. The standard Squire weighs in at 0.8 ounces, while the Key weighs in at a whopping 1.8 ounces. My Karas Kustoms Retrakt, which I consider to be on the heavy side, weighs in at 1 ounce, so in reality, it's like holding both a standard Squire along with the Retrakt and trying to write with it. Let's also not forget the stinky hands factor. I bite my nails and fidget with my hands near my mouth while messing around on the computer, so having just held a brass pen is not ideal for me. A quick wash of the hands can clear that up, of course, and some people don't mind it. For me, it's just another strike against brass pens in general. Like I said above, I like the idea of a brass pen. I love to look at someone's pen and the patina that they've put on it. It's just not something I'll end up doing. If you're a fan of brass pens and the Squire, you should jump on this right now. This is going to be extremely popular and I can see it selling out quickly. While this isn't for me, I do think it's pretty cool and should definitely exist. I'm not sure which came first, the idea of the theme or the use of brass, but if they were trying to come up with a theme around their want of making a brass Squire, they did a hell of a job with it. Available from Baron Fig, $65.